Introducing Notes for WP Courseware! 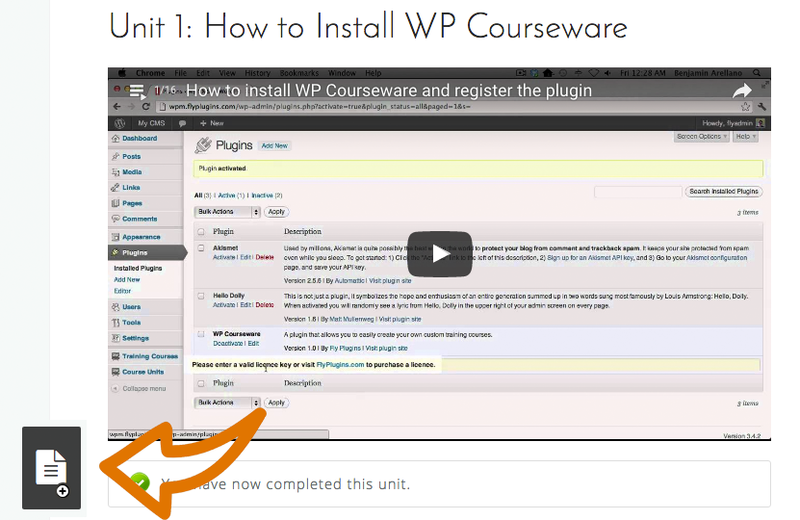 Today we’re very excited to announce another long-awaited feature addition for WP Courseware! 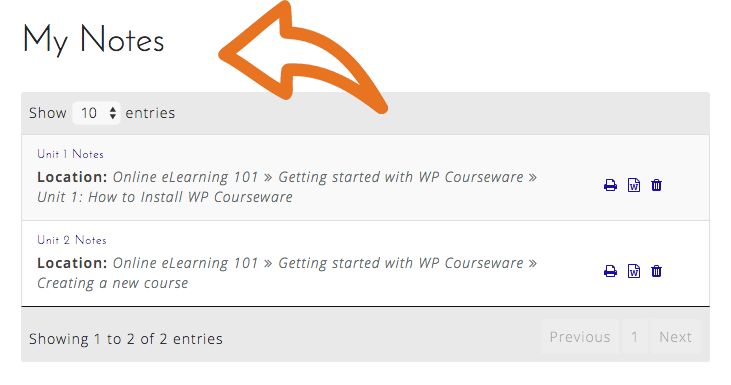 Our friends at WisdmLabs have just released Notes for WP Courseware as a premium extension…and we think you’re going to love it! 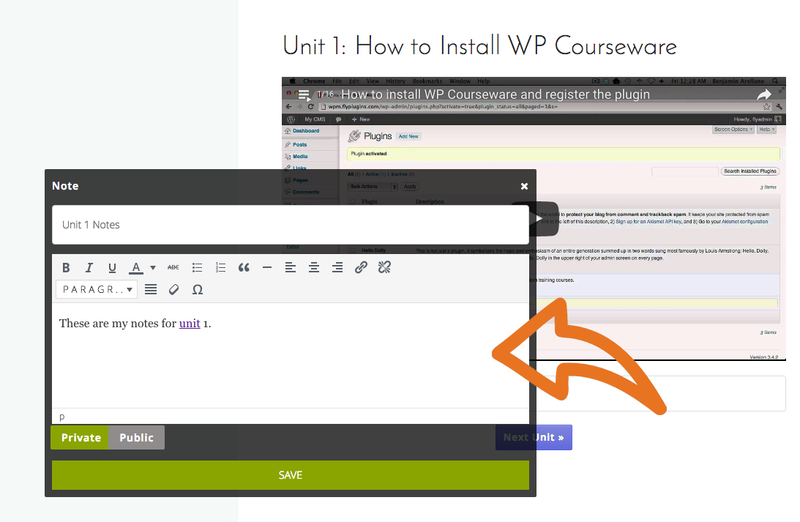 Once you install and activate the extension, Notes for WP Courseware adds a rich HTML text editor to each of your existing course units. Your students will notice a new “Add Note” icon and once clicked, the note taking editor will display. As you can see in the screenshot below, students can choose from several formatting options, including bulleted lists, block quotes, anchor text links, and more. Once a student enters content into the note for a particular unit, they will see an option to mark the note as either public or private. While adding note taking to WP Courseware course units may sound quite simple, this is where the implementation of this extension really begins to offer some unique possibilities. When the extension is installed and activated, two new pages are automatically created. You don’t need to display either of them publicly, but they can be linked to within member dashboard or course outlines pages. My Notes Page: This page is created as a private repository for a student to be able to access and review their own notes without sharing them publicly. As you can see in the screenshot below, your student will see the note title in this list, as well as a breadcrumb indicating which point in the course it belongs to. To view or edit a note, they simply click on its title. There are also options to print the note, delete it, or download the note as a document file. Public Notes Page: The extension also creates a repository page for any notes which your students choose to mark as public. The “Public Notes” page functions very similarly to the “My Notes” page, with the obvious distinction that when a student clicks on their own notes the notes are editable while clicking on notes created by other students will cause them to be read only. And while public notes aren’t meant to be a substitute for student-to-student interaction, such as you could create with the BuddyPress for WP Courseware extension, there are quite a few uses you might be able to implement. For example, we have one WP Courseware user who teaches creative writing courses and he has been waiting for this functionality to allow students to publicly share writing samples with other members of the class. And We’re Celebrating the Notes Release With a Special Offer! While the WisdmLabs team has done their best to ensure that the Notes extension is as affordable as possible to WP Courseware users, we were also able to secure an additional 10% discount on the plugin through Saturday, December 17th. If you think this is a tool which can enhance your WP Courseware courses now or in the future, we would urge you to purchase the extension prior to midnight on Saturday, December 17th to lock in your 10% discount! 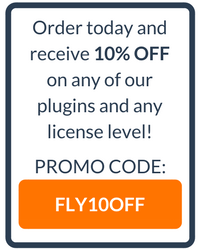 Simply click on the button below and enter the discount code COURSEWARE10 at checkout to receive 10% off on the Notes extension for WP Courseware. This discount can also be applied to the WP Courseware + BuddyPress extension from WisdmLabs. As always, thanks for your support and please let us know if there is anything we can do for you!